Timothy Zahn (born September 1, 1951) is an American writer of science fiction and fantasy. He is known for the Thrawn series of Star Wars novels, and has published several other series of science fiction and fantasy novels, in addition to much short fiction. The Thrawn trilogy, also known as the Heir to the Empire trilogy, is a series of science fiction novels written by Timothy Zahn. They are set in the Star Wars expanded universe approximately five years after the events depicted in the 1983 Star Wars film Return of the Jedi. The series introduced several notable characters, including Mara Jade, Talon Karrde, and Grand Admiral Thrawn, one of the more notable villains in the expanded universe. The Thrawn trilogy was followed by The Hand of Thrawn, a two-book series also authored by Zahn. Lombard is a village in DuPage County, Illinois, United States, and a suburb of Chicago. The population was 42,322 at the 2000 census. The United States Census Bureau estimated the population in 2004 to be 42,975. The village's challenge to the Census Bureau regarding its official 2010 population was accepted, revising the official population of the village from 43,165 to 43,395. Glenbard East High School, or GBE, is a public four-year high school located in Lombard, Illinois, a western suburb of Chicago, in the United States. It is part of Glenbard Township High School District 87. The school is known for its prominence in the areas of arts and music, and has been recognized as a GRAMMY signature school three times. East draws around 2,300 students from Lombard, and portions of Glendale Heights, Addison, and Bloomingdale. Michigan State University (MSU) is a public research university in East Lansing, Michigan, United States. MSU was founded in 1855 and served as a model for land-grant universities later created under the Morrill Act of 1862. The university was founded as the Agricultural College of the State of Michigan, one of the country's first institutions of higher education to teach scientific agriculture. After the introduction of the Morrill Act, the college became coeducational and expanded its curriculum beyond agriculture. Today, MSU is one of the largest universities in the United States and has approximately 563,000 living alumni worldwide. Zahn's novella Cascade Point won the 1984 Hugo Award. He is the author of the Blackcollar trilogy and the Cobra series (eight novels so far), twelve Star Wars expanded universe novels, including nine novels featuring Grand Admiral Thrawn: the Thrawn trilogy, the Hand of Thrawn duology, Outbound Flight , Choices of One , Star Wars: Thrawn, and Star Wars: Thrawn: Alliances . Grand Admiral Thrawn is a fictional character in the Star Wars franchise. Introduced in the 1991 Timothy Zahn novel Heir to the Empire, he is an Imperial military commander who has taken control of the Galactic Empire's remaining forces five years after the events of the 1983 film Return of the Jedi. Thrawn faces off against classic Star Wars characters Luke Skywalker, Princess Leia, Han Solo, Chewbacca, and Lando Calrissian in the Thrawn trilogy (1991–1993), but is ultimately defeated. He is seemingly resurrected in the Hand of Thrawn duology (1997–98), and his backstory is explored in various other novels, short stories, comics, and video games in the Star Wars expanded universe. The Hand of Thrawn is a pair of novels set in the Star Wars expanded universe, written by Timothy Zahn. They are sequels to Zahn's Thrawn trilogy. Star Wars: The Roleplaying Game is a role-playing game set in the Star Wars universe, written and published by West End Games (WEG) between 1987 and 1999. The game system was slightly modified and rereleased in 2004 as D6 Space, which used a generic space opera setting. 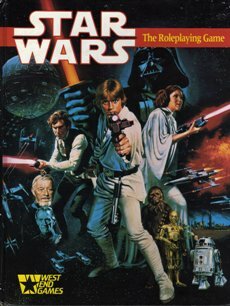 An unrelated Star Wars RPG was published by Wizards of the Coast from 2000 to 2010. Since 2012 the official Star Wars role-playing game is another unrelated game, published by Fantasy Flight Games. West End Games (WEG) was a company that made board, role-playing, and war games. It was founded by Daniel Scott Palter in 1974 in New York City, but later moved to Honesdale, Pennsylvania. Its current and past product lines include Star Wars, Paranoia, Torg, DC Universe, and Junta. Star Wars: Heir to the Empire is a 1991 Star Wars novel by Timothy Zahn, and the first book in the Thrawn trilogy. It reached #1 on the New York Times Best Seller list. The Thrawn trilogy marked a revival in the fortunes of the Star Wars franchise, bringing it widespread attention for the first time in years; all three Thrawn trilogy novels made the New York Times Best Seller List,  and set the stage and tone for most of the franchise's expanded universe content. Zahn also wrote the young adult Dragonback series and the popular Conquerors' trilogy. The Conquerors a trilogy of science fiction novels by American writer Timothy Zahn, published between 1994 and 1996. Star Wars: The Last Command is a 1993 Star Wars novel by Timothy Zahn, and the third book in the Thrawn trilogy. Mara Jade is a fictional female character within the Star Wars franchise. She appears in the now non-canon Legends series, as the wife of Luke Skywalker and mother of Ben Skywalker. In the different video games, she has been voiced by Heidi Shannon, Edie Mirman and Kath Soucie. Despite not being part of the regular canon and never appearing in the film series, Mara is considered one of the most popular Star Wars characters. Michael Austin Stackpole is an American science fiction and fantasy author best known for his Star Wars and BattleTech books. He was born in Wausau, Wisconsin, but raised in Vermont. He has a BA in history from the University of Vermont. From 1977 on, he worked as a designer of role-playing games for various gaming companies, and wrote dozens of magazine articles with limited distribution within the industry. Coruscant is an ecumenopolis planet in the fictional Star Wars universe. It first appeared onscreen in the 1997 Special Edition of Return of the Jedi, but was first mentioned in Timothy Zahn's 1991 novel Heir to the Empire. Coruscant was historically referred to as Notron or Queen of the Core; was renamed Imperial Center during the reign of the Galactic Empire and Yuuzhan'tar during the Yuuzhan Vong invasion. The planet's capital city was initially Galactic City ; under the Galactic Empire this was Imperial City, and was Republic City or the City Of Spires under the Galactic Republic. The planet was code-named Triple Zero during the Clone Wars. 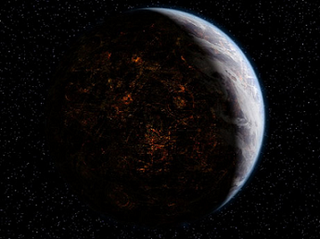 The demonym and adjective form of the planet name is Coruscanti. The Solo family is a fictional family of characters in the Star Wars franchise, whose key member is smuggler Han Solo, one of the central protagonists of the franchise starting in the original film trilogy in which he is featured prominently throughout. Subsequent to these films' events, Han marries Princess Leia, hence connecting her family tree to his; their son Ben Solo is introduced in the 2015 film Star Wars: The Force Awakens. Star Wars: Dark Force Rising is a 1992 Star Wars novel by Timothy Zahn, and the second book in the Thrawn trilogy. Specter of the Past is the first of the two Hand of Thrawn novels by Timothy Zahn, which follow his Thrawn trilogy. The term expanded universe, sometimes called an extended universe, is generally used to denote the "extension" of a media franchise with other media, generally comics and original novels. This typically involves new stories for existing characters already developed within the franchise, but in some cases entirely new characters and complex mythology are developed. This is not necessarily the same as an adaptation, which is a retelling of the same story that may or may not adhere to accepted canon. Nearly every media franchise with a committed fan base has some form of expanded universe. Outbound Flight is a novel set in the Star Wars expanded universe, released on January 31, 2006. Written by Timothy Zahn, it is a prequel to Zahn's Thrawn trilogy (1991–93). The book was released by Del Rey, first in hardcover, then in paperback in January 2007. The cover art is by Dave Seeley. Allegiance is a novel set in the Star Wars galaxy released in January 2007 by Del Rey. The book was written by Timothy Zahn. Star Wars expanded to other media includes all Star Wars fictional material produced by Lucasfilm or officially licensed by it outside of the original Star Wars films and television series. Intended as an enhancement to and extension of the theatrical films produced by George Lucas, the spin-off material was moderated by Lucasfilm, and Lucas reserved the right to both draw from and contradict it in his own works. This includes an array of derivative Star Wars works produced in conjunction with, between, and after the original trilogy (1977–1983), prequel trilogy (1999–2005), and sequel trilogy (2015–2019) of films, and includes books, comic books, video games, and television series. This is complete list of works by American science fiction and fantasy author Timothy Zahn. Star Wars: Thrawn is a Star Wars novel by Timothy Zahn, published on April 11, 2017 by Del Rey Books. It chronicles the origins of Grand Admiral Thrawn, a popular character originating from the Star Wars Legends line of works, which were declared non-canon to the franchise after Lucasfilm redefined Star Wars continuity in April 2014. The novel was announced in July 2016 alongside news that the character Thrawn would be reintroduced into the Star Wars franchise on the 3D CGI animated television series Star Wars Rebels. ↑ Timothy Zahn (Author of Heir to the Empire) Retrieved 2018-11-24. ↑ Borrelli, Christopher (May 23, 2017). "Novelist Timothy Zahn is the man who saved 'Star Wars,' according to fans". Chicago Tribune . Retrieved May 23, 2017. ↑ "1984 Hugo Awards". The Hugo Awards. 1 2 3 Shannon Appelcline (2011). Designers & Dragons. Mongoose Publishing. ISBN 978-1-907702-58-7. 1 2 Breznican, Anthony (November 2, 2012). "Star Wars sequel author Timothy Zahn weighs in on new movie plans". Entertainment Weekly . Retrieved July 21, 2016. Tor Books is the primary imprint of Tom Doherty Associates, a publishing company based in New York City. It primarily publishes science fiction and fantasy titles, and publishes the online science fiction magazine Tor.com.